On Saturday, December 3rd the annual winter race meet at Gulfstream Park got off to its earliest start ever. While in the past South Florida race fans needed to wait till after the new year to experience world class racing – they have now been rewarded with an entire extra month of racing. The 2011 – 2012 racing season at Gulfstream will run till April 8, 2012. While other tracks around the US are struggling to remain competitive Gulfstream Park saw increases across the board in wagering on all types of races last year. This year’s meet brings a few changes to the wagering menu at Gulfstream which remains one of the most diverse in the nation. For the first time ever a Super Hi 5 wager with a minimum bet of $1 will be avlible on each day’s race card with a carryover feature that transfers 75% of the wagering pool to the next day. A 50-cent Pick 5 will also be avlible on the last five races of the day. Both the 50-cent Pick 5 and Super Hi 5 feature an ultra low takeout of 15%. The 10-cent Rainbow 6 will be back this year – after a great response from horseplayers last year. This bet pays out the full amount of the pool to a single ticket holder with the correct pick-six combination. If there is more than one winning ticket those with the correct combinations will receive a payout, however, it will not be the full amount of the pool. Last year this created a situation where the bet went un-hit all year long creating a situation where there was a mandatory payout on the last race day of the season. The pool by then reached over $5 million dollars. The Rainbow 6 and regular Pick 6 wager have a takeout rate of 20% which is considerably lower than other tracks around the US. As usual there will be two Pick 4 wagers on each race card as well as rolling daily doubles and Pick 3 bets. Superfecta minimums are still .10 cents and the minimum on trifectas has been lowered to .50 cents. To keep up with all the great racing and stakes action at Gulfstream be sure to keep an eye out for free Gulfstream Park picks and selections offered on this blog. 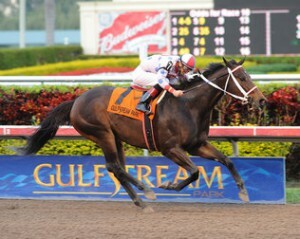 Winning Ponies will also be offering daily selections on each and every race at Gulfstream all winter long.